Did a Monday Montpeculiar run - police headquarters. St. Patrick, aka U.S. Sen. Patrick Leahy was having a presser. Announced an extra $1 million earmark for the Vermont Drug Task Force. All the TVs showed up: Ch. 3, Ch.5 and Fox 44! That's John Patrick Tracy, a Leahy Vermont staffer and former Democratic leader-type under the Golden Dome, joining the senator. Tracy remains a future something-or-other, eh? 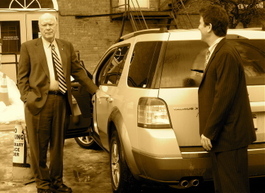 In case you were wondering what his duties currently include, among other things, Tracy "staffs" pressers such as these and when required puts his body in between the journalist/blogger (moi) with the camera and the New York license plate on the vehicle the senior senator from Vermont, his boss, is driving. "It's a rental," said St. Patrick, that he'd picked up at the Burlington Airport. No big deal, but he sure didn't like the sight of me and the camera. Touchy, touchy. During the presser, Sen. Leahy mentioned at least three times that his father had been born in Barre, Vermont. Then he hit Burlington for an "I Love Obama" presser with Ben & Jerry. And he "unveiled" the new Obama radio ad he made with his better half - wife Marcelle Leahy. Yours truly went over to a friend's place for some tea and a lovely little nap.